Getting ready to go biking. Since the Election, there has been a number of ways the public has been invited to have a “say so” in the decision making of the new Camano Island Library. The Camano Library Building Committee held an Open House/comment gathering session at the site of the new library (the former Islander’s Restaurant) from 4 p.m. until 7 p.m. July l. All Camano Island residents were invited to stop by and give their opinions about possible features of the new library. Input gathered at the meeting will help guide the work of the building committee. Our last monthly meeting (until fall) of the Camano Island Library Friends is Thursday, June 26 at 7 p.m. Elections for all four offices will take place. You can also find out what’s going on this summer at the library and in the renovation of our new building at Terry’s Corner. Mary Jennings, who coordinates the children’s programs for our Camano library, needs four helpers for the final summer program on Friday, Aug. 15 from 12:30-2. It’s a lively outdoor program and a super finale to the summer reading outreach. 8/15/14 Summer Program for Camano Library outreach bash. own beverages. 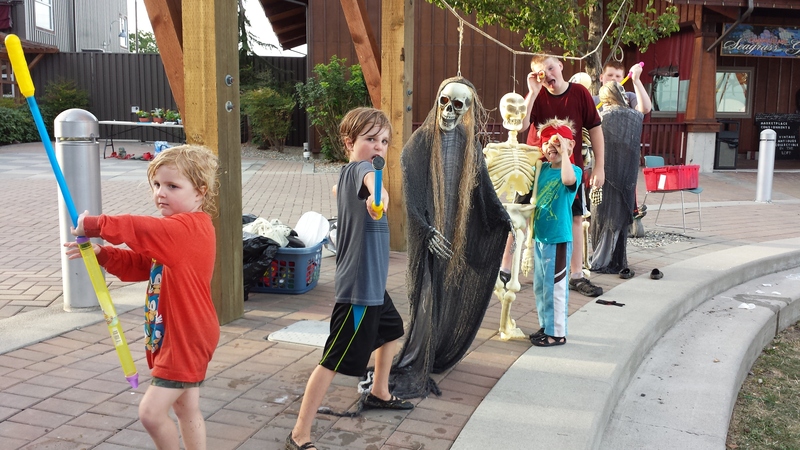 Pirate-themed activities will abound for all ages! that support our library. Get your pirate on and join in the fun! 9/16/14 Public Meeting: Give your opinion for interior design for the Library. Please plan to attend a public meeting at the new library building on September 16 to hear about possible interior features and give your opinion about your preferences. The meeting is scheduled from 4 until 7 pm, with a presentation repeated at 4, 5, and 6 p.m. Cookies and coffee will be served, and contributions of cookies by members of Camano Island Library Friends would be appreciated. 9/25/14 Camano Island Friends Library Meeting: 7 pm. John Hamer has fielded complaints from readers, listeners and viewers about the state’s news media for the past 15 years. He will discuss efforts of the Washington News Council to mediate these complaints when he speaks to the Camano Island Library Friends at 7 p.m. Thursday, Sept. 25, at 7 p.m.
Hamer, a long-time journalist, was executive director of the Washington News Council from its formation in 1998 until it closed its doors this summer. The public is invited to attend. Click on link below to see the most recent updates about the library. Camano Island will have a permanent library, thanks to passage of a $2.3 million bond levy. The library ballot measure received the approval of 62.05% percent of Camano Island voters on April 22. Vote results will be officially certified on May 6 and additional information on vote counts and precinct results are available on the Island County Auditors elections web site, http://vote.wa.gov/results/current/island/. The Camano Island Library advisory board and Sno-Isle Libraries sought a voter decision on a 10-year general obligation bond to cover all capital costs associated with purchasing, remodeling and opening a 4,900 square foot library at the site of a former restaurant at Terry’s Corner. Bond funds will reimburse the library district’s Land Acquisition Reserve Fund for costs of purchasing the building in mid-2013. That purchase kept the building from becoming unavailable as a future library facility site when the property began moving into foreclosure. In August 2013, voters approved creation of a special library capital facility area taxing district but failed to approve the proposed library bond levy by a narrow margin. Over the next 90 days, the library district will search for an architect and assemble a library capital project building committee. This building committee will include the project architect, library project staff team, a local library advisory board member, and a member of the Friends of the Camano Island Library. The group will develop plans to convert the former restaurant building into a library, within the approved budget. Building committee members will provide input, give feedback and take part in important discussions involving the project. Building committee work will begin in late May and expected to last through winter 2015. “Camano Island residents will have the opportunity to view and comment on design options before renovations begin,” said Jonalyn Woolf-Ivory, the Sno-Isle Libraries executive director. Meanwhile, library officials have been successful extending the lease on the current library space—located at Terry’s Corner through the month of May. Officials are hopeful that voter approval of Proposition 1 will enable further negotiations to proceed for interim library service in the space until the doors open for the larger library. For more information, please call Sno-Isle Libraries at 877-766-4753 or visit http://www.sno-isle.org. Sno-Isle Libraries serves 687,680 residents through 21 community libraries across Snohomish and Island counties, as well as through online library and mobile library services to childcare, preschool and senior centers. There are 10,612 registered library customers on Camano Island. Go to At the Events Page for a new update. Unofficial results, there are still lots of votes to be counted. To view official Results go to Election results tab on menu.